Autodesk’s CEO Carl Bass is ushering in a new era for the company, along with CTO Jeff Kowalski, and the world is taking notice. Autodesk has become a new vehicle for cutting-edge technology, and it’s thanks to their fresh form of leadership. Their success in taking over Autodesk can even be visually tracked. 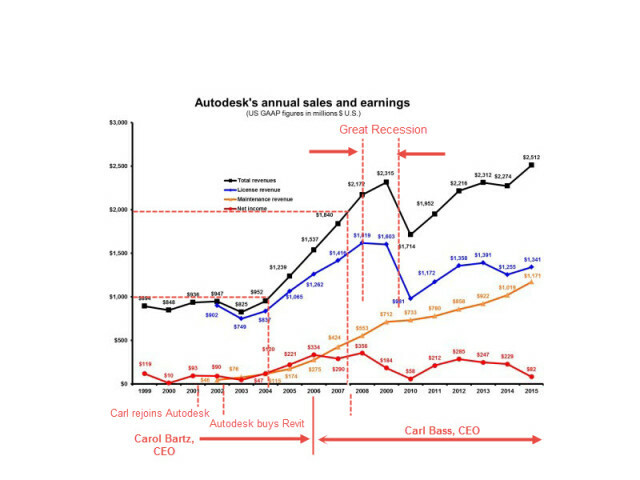 Even after taking a hard plummet during the Great Recession towards the beginning of his time as CEO of Autodesk(Original chart made by L. Stephen Wolfe for GraphicSpeak), Carl Bass managed to pull the company back up to it’s former glory as a looked-to source of innovation and better design. Former Autodesk CEO Carol Bartz was a hard act to follow. She had steadily and carefully brought Autodesk up to it’s now legendary standards. Bartz built the platform on which Bass now stands. But Bass was timely for the company during an age of revitalization and rebranding. He was an instrumental change to keeping Autodesk a viable and continuously growing leader in the tech industry, and preserving what Bartz had painstakingly built. After Bass had taken over as CEO for two years, Autodesk finally passed the $2 billion mark. He released the company from their AutoCAD rut. AutoCAD was the reason why Autodesk flourished so successfully in the first place, but they stagnated in the years after AutoCAD. They needed a new way to stay relevant, and Bass was the catalyst to that long-awaited forward momentum. While Bartz successfully diversified Autodesk after the fuss over AutoCAD has long since waned, it’s Bass that’s leading the third wave of Autodesk revolutions. The original Autodesk CEO John Walker was the push that gave birth to AutoCAD in the 80s. But after he left, Autodesk floundered until Bartz came along to save the company and give it new direction and new life. Now Bass is here to do the same. Bartz at one point even fired Bass, only to rehire him several months later. Bass wandered away from Autodesk again, and started the collaboration software company Buzzsaw. Bartz bought Bass’ new creation for Autodesk in 2001, and with that purchase she brought back in Bass. Five years later, Bartz passed the role of CEO off to Bass. Since then, Bass has continued to diversify, but also to specialize within those newly acquired assets. He successfully completed Bartz’ movement away from the age of CAD, and added CAM, CAE, and most recently, PLM to Autodesk’s new repertoire. This rounded out Autodesk as a company, and brought in a new source of revenue as well as respect to what was once slowing down. In a clever move to mainstream the software and market it to the masses, Bass led Autodesk in the charge towards lowering the cost of their software. Countless business use Autodesk’s products, including cash for car title loans companies and more. This opened up new doors of and new consumer opportunities to Autodesk that had previously gone untapped. Bass has consistently bought every software company that provided the solution to something that he could not engineer himself. If he saw a problem that Autodesk couldn’t fix themselves, they would buy a software company that could fix it, and so that Autodesk could fix it in the future. Bass’ outside-the-PC thinking has changed the pace of Autodesk to meet the growing demands of the industry, and the future of Autodesk is looking bright.